Caroline Tarjan is an Associate Lawyer at Smitiuch Injury Law. 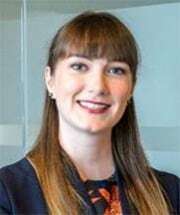 After articling with the firm, she was called to the bar of Ontario on June 26, 2018. She will be working directly for the firm's Principal, Michael Smitiuch, on personal injury matters. While in law school, Caroline enjoyed participating in community legal clinics including the Queen's Prison Law Clinic, the Queen's Elder Law Clinic, and Queen's Legal Aid. She also completed a certificate in Public International Law in England. While at Queen's, she represented the interests of students as a Faculty Board Representative with the Law Students' Society, sat on the Admissions Committee, and participated in intramural soccer and dodgeball. In her final year, she received the course prize in Wills and Estate Law. In her spare time, Caroline spends time with family and friends, plays sports, and travels around the world.